It is our great pleasure to inform you that the exhibition Eternal Gradient is travelling to Graham Foundation in Chicago. There will be public programs during the exhibition period. In the early 1960s, Arakawa and Gins began a remarkably original and prolific partnership that encompassed painting, installations, poetry, literature, architecture, urbanism, philosophy, and scientific research. Complementing their independent artistic and literary practices, their collaborative work launched with visual, semiotic, and tactile experiments that questioned the limits and possibilities of human perception and consciousness. 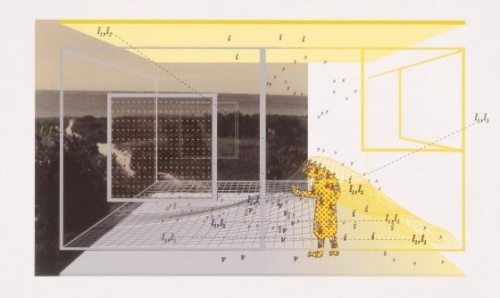 During the 1980s—a critical juncture in their careers—this line of inquiry became increasingly spatial as Arakawa and Gins together developed a series of speculative architectural projects that sought to challenge the bodily and psychological experience of users. Through these investigations, the artists began to articulate their concept of “Reversible Destiny,” arguing for the transformative capacity of architecture to empower humans to resist their own deaths. This exhibition uncovers a little-known body of this visionary work that anticipated the artists’ subsequent commitment to architecture and their realization of various “sites of Reversible Destiny,” in Japan and New York between 1994–2013. The exhibition was curated by Irene Sunwoo, GSAPP director of exhibitions and curator of the Arthur Ross Architecture Gallery, with Tiffany Lambert, GSAPP assistant director of exhibitions. The Graham Foundation presentation is organized by Sarah Herda, director, and Ellen Alderman, deputy director of exhibitions and public programs. The exhibition design is by Norman Kelley, a Chicago & New Orleans architecture and design collective founded by Carrie Norman and Thomas Kelley.